Koreatown is a distinctly multiracial and multiclass neighborhood with strong immigrant roots. Set in a neighborhood of aging historic buildings, years of disinvestment, and small mom-and-pop businesses, Koreatown residents built a resilient community out of struggle and unity. The densest and most park-poor neighborhood in LA County, Koreatown has a population of over 120,000 people that grows every year with new developments. Longtime working class individuals and families are continuously displaced with skyrocketing rents and evictions by developers and landlords looking to attract wealthier newcomers. Koreatown is changing—rapidly—and the future of a vibrant, thriving Koreatown starts with protecting our long-time, working-class neighbors and stabilizing local economies who make this neighborhood what it is. Learn more about Koreatown’s history, demographics, and its changing economy in this report with the USC Pere Program. 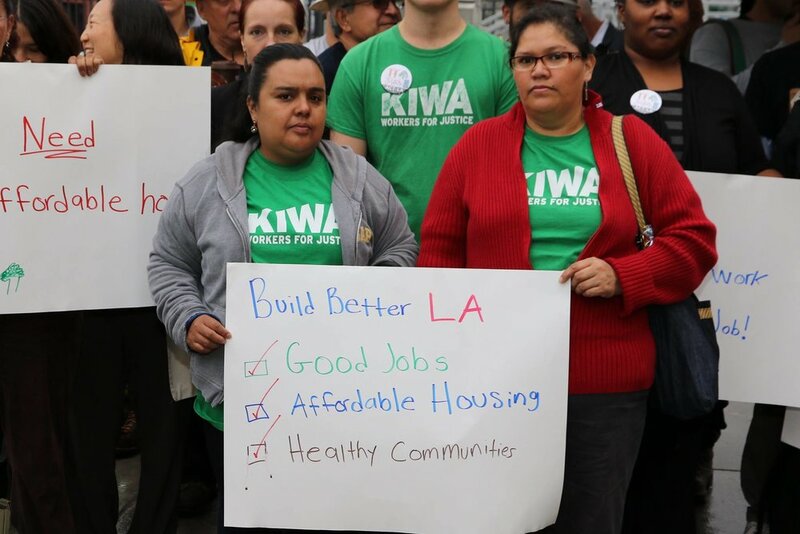 KIWA is on the host committee for ACT-LA, a city-wide coalition of housing, transportation, and labor advocates, as well as environmental justice organizations and affordable housing developers, that seeks a sustainable transit systems and neighborhoods for ALL people in Los Angeles, placing the interests of low-income communities and communities of color first as we create a more sustainable city. Through strategic campaigns and public actions, ACT-LA is ensuring that LA’s transit expansion has the potential to benefit, rather than harm, working people and their families. There is a deep, unmet need for affordable housing in Los Angeles and across California. In partnership with Little Tokyo Service Center, KIWA developed an affordable housing in Koreatown named Casa Yonde. Its name apt for KIWA’s work in multiethnic solidarity building, Casa Yonde couples the words Casa meaning “home” in Spanish and Yonde meaning “solidarity” in Korean. Casa Yonde is a 52-unit, 100% affordable, LEED Platinum project with 18 homes set aside for homeless transitional aged youth (TAY) and survivors of domestic violence. With this, we seek to demonstrate that we can and must build housing that is affordable, beautiful, and environmentally sustainable. Koreatown is the densest and the most park-poor neighborhood in Los Angeles. Lack of access to open space, urban parks, and recreation centers in low-income communities of color is a basic quality of life issue rooted in historic race and class inequity. Our communities deserve green space where seniors can gather, children can play, and workers can rest! 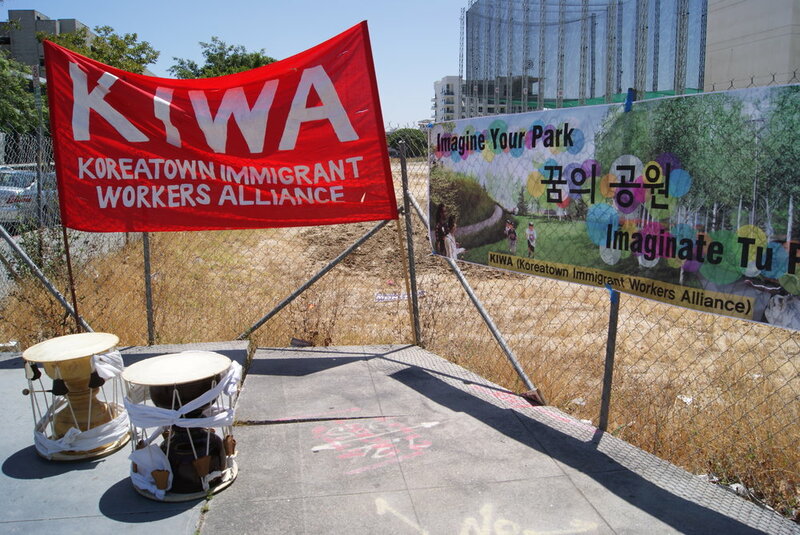 Learn more about our work on green space preservation and creation in Koreatown here. KIWA is on the Steering Committee for Blue LA’s EV Carsharing Program in partnership with LA Department of Transit (LADOT) and the Mayor’s Office of Sustainability as part of the City of Los Angeles’ mobility strategy. This program aims to address the car ownership culture in Los Angeles and become a viable and sustainable public transportation option for all Angelenos, especially for low-income communities of color. A system of 100 electric vehicles and 200 charging stations will be available in central Los Angeles including Westlake, Koreatown, Pico-Union, Downtown, Echo Park, Boyle Heights, and Chinatown in 2018.